Equipment: satellite TV; internet access Wi-Fi (included); washing machine, dryer, iron/ironing board; heat pump heating system; storage room in the house. detached house, 8 people, 6 room/s, 4 bedroom/s, 1 bathroom/s, approx. 200 m², 3 floor/s, restored 2010. Feature: Please note: Non-smoking house. Furnishing: good, tasteful, tiled floor, wooden floor. Bedroom 1: (floor 1): double bed (1.80 m wide, 2.00 m long). Bedroom 2: (floor 2): double bed (1.80 m wide, 2.00 m long). Bedroom 3: (floor 2): double bed (1.50 m wide, 2.00 m long). Bedroom 4: (floor 2): double bed (1.50 m wide, 2.00 m long). Dining area: open to the living room, (floor 1). Kitchen: Kitchen/ cooking equipment: 4 ceramic hobs, oven, microwave oven, dish-washer, refrigerator, coffee machine, water boiler, toaster, freezer approx. 50 litre. open to the dining area (floor 1). Living room: (ground floor): furniture suite, fireplace, exit. From the living room stairs to upper levels. Living room 2: (floor 1): furniture suite, fireplace, exit to balcony. Sanitary 1: (ground floor): shower, WC, sauna. Sanitary 2: (floor 2): separate WC. Access/parking: parking on the estate. Bathing jetty/bathing: bathing place (private use) in approx. 30 m.
Estate: (private use): open plot, meadow. Fishing: fish-processing table outdoors. good fishing possibilities. Information on the boat(s): Motor boat (20.0 hp; 16.0 foot; payment, on order). Outdoor facilities: (private use): terrace (partially roofed), reserved open space, balcony (partially roofed), furnishing provided, transportable barbecue. Arrival: Airport Bergen Flesland in approx. 189 km. Ferry port Bergen in approx. 187 km. Train station Voss in approx. 90 km. Beach/waters: Fjord (without crossing the street) in approx. 30 m (Esefjord). Sandy beach in approx. 6 km (Balestrand). Bus stop: Bus stop Dragsvik ferjekai in approx. 3.6 km. Nearest neighbour: Nearest neighbour in approx. 50 m.
Next village/town: Center Balestrand in approx. 6 km. Høyanger in approx. 50 km. Sogndal in approx. 41 km. Secondary road: in approx. 5 m.
Shopping: Next shopping possibility (Balestrand) in approx. 6 km. We are a family of four and had a great stay at Kari’s House in Balestrand. 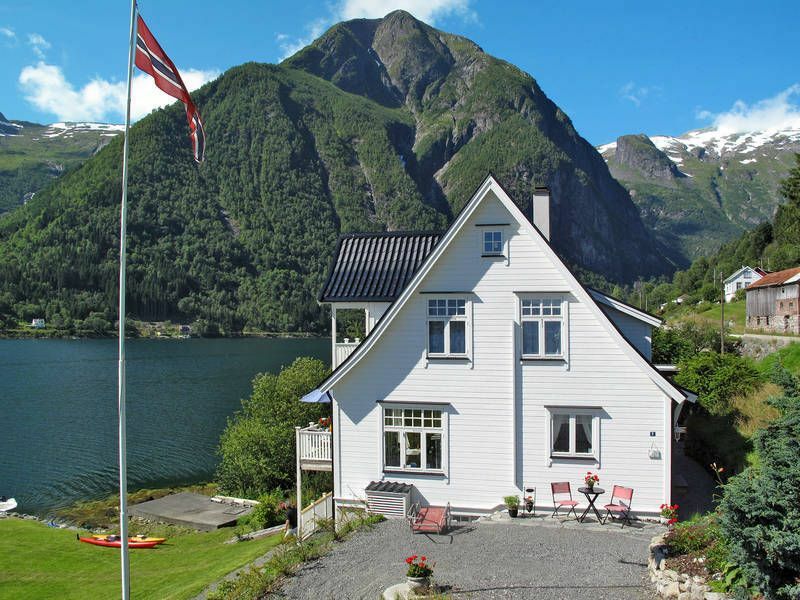 The house has everything you need for a comfortable stay of one week or longer and is in a great location to explore the fjord. Area highlights included great hikes around Balestrand, easy daily boat ride into town, and fishing and relaxing on the dock and garden. Kari and Inge were very responsive and helpful. Finnt hus, underbart landskap, finna folk. Love it.